These entry-level NP5A5 are 75% the size of full-size NP5 AEGs. They are lots of fun to shoot in their full auto mode and feel very much like the more expensive full size AEGs from Tokyo Marui! 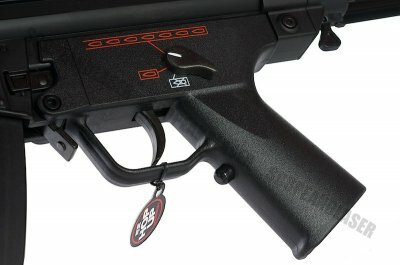 Many great features found on the full-sized and more expensive AEGs are also found on this entry-level model, including a 2 position metal retractable stock (makes gun 437mm-562mm), metal front sling mount for sling attachment, removable magazine (holds 110 rounds), metal select-fire switch that toggles between semi-auto and full auto fire!! 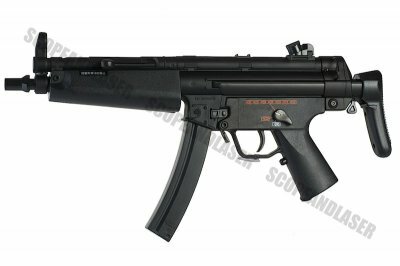 This mini-MP5 AEG is lots of fun to shoot, with full auto fire delivering an impressive 10-12 rounds per second, just like the bigger full featured AEGs (though power is significantly less for recreational use). It also sounds like the much bigger AEGs, though just a bit quieter. Specially designed removeable magazine operates like a hi-cap magazine that allows each to hold 110 rounds of BBs! 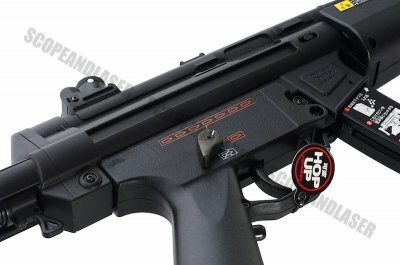 You can attach a standard 3-point tactical sling onto this AEG. 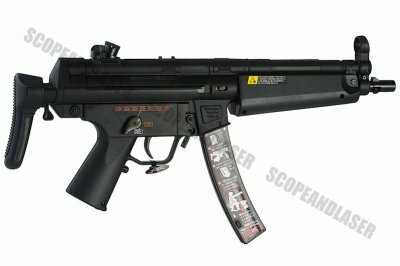 Due to dimensional differences with its larger life size AEG siblings, these mini AEGs cannot take silencers, scopes and other accessories. Runs on 6 AA batteries (not included and sold separately). Please remember to use 0.12g BBs only as designed for this gun. 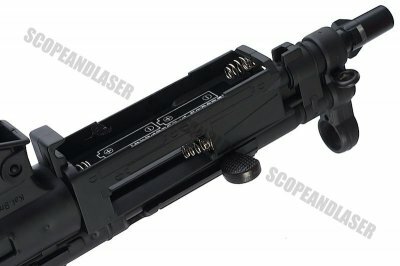 Using heavier BB's may cause jamming in barrel and cause permanent damage to this gun.